The peppermint herb is a natural occurring cross between water mint and spearmint herbs and grows throughout Europe and North America. Peppermint oil is often used as a traditional remedy for nausea, indigestion, cold symptoms, headaches, muscle and nerve pain, stomach problems, and bowel conditions such as irritable bowel syndrome. A preliminary report showed that peppermint oil has relaxing and pain relieving effects, and may be useful as a topical remedy for tension-type headache. In a double-blind study, spreading a 10% peppermint oil solution across the temples three times over a 30-minute period was significantly better than placebo and as effective as acetaminophen in reducing headache pain. Similar use of an ointment combining menthol and other oils related to peppermint oil was also as effective as pain relieving medication and superior to placebo in another double-blind study. Peppermint Oil is listed(1) as useful for Gingivitis, Indigestion, Heartburn, Low Stomach Acid, Irritable Bowel syndrome, Tension Headache, Chronic Candidiasis, Colic, Common Cold, Sore Throat, Gallstones, Halitosis, Poison Oak/Ivy and Low Back Pain. Don't let our LOW PRICES fool you, this is a HIGH QUALITY product. 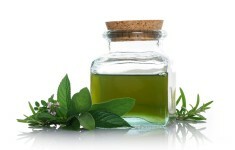 Other companies charge FAR MORE for inferior Peppermint Oil or oil filled with impurities. You simply can not find a higher or more effective grade of Peppermint Oil anywhere. We are so confident in the quality of our product that we will give you your money back if you are not satisfied for any reason. Why pay more for lower quality Peppermint Oil? When it comes to PRICE & QUALITY Bio-Alternatives is simply the best value available!